Writing code all day will make just about anyone feel crazy, and last Monday the monotony was starting to get to me, so I walked down to my neighborhood Sur La Table, and I bought myself a flamethrower. If you are putting together the menu for a bar, a flamed drink serves two purposes; first, it gets the attention of all your patrons, and incites them to order “the one with the fire”, which hopefully equals more sales. Second, it’s flipping awesome. 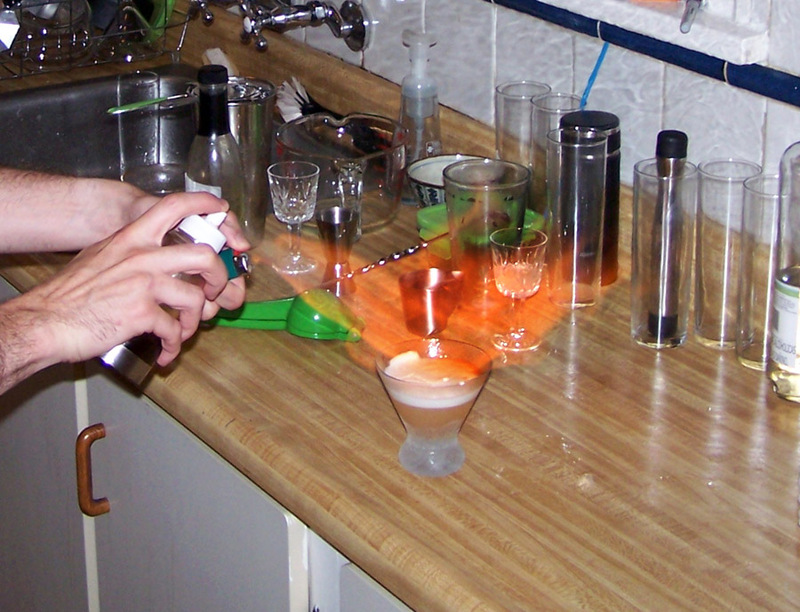 Jeffrey Morgenthaler describes a technique for flaming a drink in which he fills a pressurized olive-oil sprayer with a mixture of bitters and Stroh 160, and then uses it to flame the surface of a Pisco Sour. The Pisco sour is an ideal candidate for this treatment, because it is made with an egg white, and as such has a rich, foamy head. 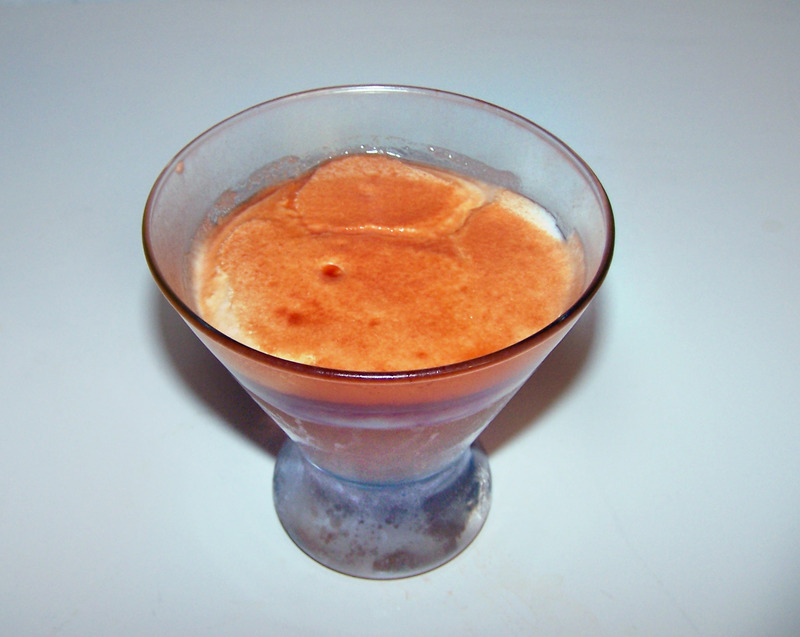 You could garnish any mixed drink with scorched bitters, and it impart the same aroma, but egg white drinks have the added bonus that you can caramelize the top of the foam, capturing the the flavor of the bitters as well. The garnish in a drink should look beautiful, but it also plays a functional role most of the time: it gives the drink most of its aroma. A mixed drink does not have a strong smell, but a fresh herb, spice, or citrus peel completes the experience of the drink. In that sense, scorched bitters is the garnish, even though it leaves no tangible artifact in the glass. Some men just want to watch the world burn. In order to take this picture, I had to spray fire all over the egg white for about three times as long as you’re supposed to, and the surface that was touched by the flame turned into a paper film with the flavor of crème brûlée, and a texture that I wouldn’t serve to anyone whom I actually liked. As a matter of fact, it took me three of these before I got it right, but the research was not unpleasant. You probably know all about the Pisco Sour–Pisco is a type of pomace brandy, similar to grappa, and is the national spirit of Peru. Moreover, the Pisco Sour is the Peruvian national cocktail, which they celebrate on the first Saturday of every February. It is a very simple drink, but there are a couple of interesting details, which I shall discuss momentarily. Dry shake* and then add ice and shake again. Double strain into a cocktail glass. Fill an olive-oil sprayer with a mixture of Angostura bitters and 151 rum (or Stroh 160) and burn the top of the egg white foam for a few seconds. If your drink looks like the one in my picture, you actually overdid it with the fire. You don’t want a slimy membrane of burned meringue on top of your drink. Most Pisco sour recipes only call for half an egg white, but I like to use a whole one in this kind of application, to guarantee that you have plenty of foam to work with. The traditional garnish for a Pisco sour is freshly-grated nutmeg, and I honestly prefer that to the more common (in the states) clover made out of angostura bitters. Scorching the bitters is a fun variation, however, and worth it just for the pyrotechnics. *A note on dry shaking your sour: I always used to find that, when dry-shaking my drinks, little droplets from the drink would escape from my shaker and get all over my hands and clothes. This frustrated me greatly, because in order to properly dry-shake a drink, you need to shake it mightily, and in so doing whip up the egg white into a rich foam. I asked around on the internet, and they told me that the temperature of a drink with ice is what prevents it from breaking through the seal on your shaker. So for this drink, I placed a single ice cube in the shaker for my “dry” shake, and I was delighted to discover that the drink did not leak. Categories: classics | Tags: angostura bitters, cocktail, cocktails, drinking, drinks, egg white, fire, jeffrey morgenthaler, lime juice, misto, mixed drinks, peru, pisco, pisco sour, scorched bitter, spray bitters | Permalink. I have discovered that dry shaking in a sealed, screw-top container works well, for example the kleen kanteen bottles. After you dry shake in the bottle you can dump the contents into a three piece shaker to shake with ice or pour over the rocks.